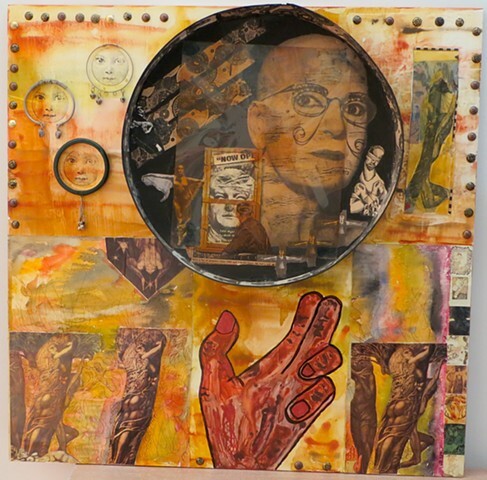 24" X 24 " X 2 3/4"
the large circle in the top of the painting is a collage in a large brie cheese box. bam!! supremely cool ... !! what a fabulous work on this collage ... rock on! Divina e muito fascinante. Bela poesia. Abraço. This one is SO intriguing! One more fantabulous Artistic Creation, Jennifer !!! I wish to it (and to you too) a lot of Success !!! You are so creative, artistic and full of superb imagination. Interesa pentrao kun multaj detaloj, ;iam permesas la menson libere flugi. Dankon pro bela laboro. Marvelous work and beautifully done. Gorgeous mix of media and very creative! A great blend of scenes and moods. Another top notch piece of artwork. Your art is so unique! Very well done. You are very artistic and creative. You gathered here beautiful colours and symbols in a fine art. Hi Jennifer, interesting art, as always..enjoy the holiday season! Hello Jennifer and Happy New Year! I can't wait to see what amazing things you come up with this year! Terrific work! Very creative. Have a wonderful week! Amazing work, Jennifer! Have a wonderful week! Take care! Des plus originales vos créations....! Terrific piece Jennifer. Love everything about it. Great symbolic work, my friend! Amazing! Great work... I can't imagine getting tired of this. Very rich, subtle. Love the palette here. Superb creation Jennifer, have a beautiful weekend. I like the way you can put your own interpretation on your work - sometimes I found them dark and sinister and other joyful and uplifting but always full of vitality and colour. beaucoup de patience pour ce Mandala, beau résultat; il invite à la méditation ! Great water painting ! This is really wonderful picture ! Splendid colors and composition, Jennifer ! Fabulous composition on this one Jennifer and lovely pastel colours on this mixed media presentation! Very creative and a wonderful piece of artwork too!